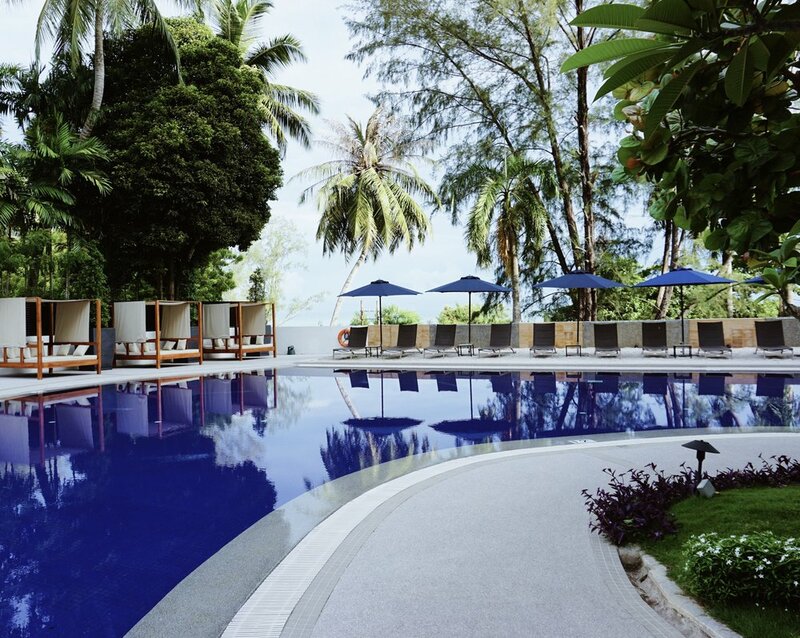 If you're going to Penang and aren't sure where to stay, look no further than the DoubleTree Resort by Hilton. This resort is located directly across from quiet Miami Beach, and just a short drive away from the hustle and bustle of tourist hot sports like downtown George Town and the night markets of Batu Ferringhi. Its convenient location, numerous amenities, and incredible views make it the perfect home base during your trip to Penang. I had the chance to stay here over my birthday weekend, and loved it so much that I nearly pushed my flight to Korea back another day. Whether it's sun up or sun down, you're sure to get a great view from your room or private balcony at the DoubleTree Resort. Don't believe me? Check out what we woke up to on my birthday. Though it was barely 7 a.m. on the morning after a long day of travel, the bright pinks and purples in the sky had me feeling energized... so I did what any energetic 20-something birthday girl would do. I ordered a bottle of bubbly and Andrew and I did a champagne cheers to begin the day and (for me) another year of life. At the Double Tree’s Makan Kitchen, the limit does not exist. Drink all the coffee you can handle with a delicious, buffet style breakfast featuring both international dishes and local favorites. We really enjoyed the made to order omelettes and colorful spread of fresh fruits.... and, of course, the coffee. Lots of coffee. WARNING: Don't leave your food unattended! Makan Kitchen's open air design is all fun and games until a crow is swooping in and picking at your breakfast before you have a chance to. Though we only ate here for breakfast, Makan Kitchen is open for breakfast lunch and dinner. Enjoy a cocktail or a coffee in the beautiful Axis Lounge, open everyday from 10 a.m. to 12 a.m.
Conveniently located in the lobby, the beautiful modern design and open air feel of the Axis Lounge make it an enticing spot to stop in for a quick holiday drink. However, Happy Hour (which actually lasts four hours - from six to ten) means half priced drinks... so that's the best time to go! The Axis Lounge also has live music on Friday and Saturday evenings! Don’t feel like leaving your room? Dine in anytime with 24 hour room service. Though severe storms and rain were in the forecast for every day of our trip, we were lucky enough to have perfect weather - I'm talkin' sunshine and blue skies during the day, and epic thunderstorms after sundown. Given the beautiful weather, we couldn't pass up the opportunity to spend some time poolside at the DoubleTree Resort.... and, so, for the greater part of a day, that's exactly where we were. Painful sunburn aside, I do not regret our decision to be lazy and hang around this beautiful property at all... I do, however, regret not applying more sunscreen. Catch some sun, cool off in the shade of the cabanas, embrace your inner kid at the splash park, or do all of the above. (Disclaimer: I'm not actually sure if there's an age limit on this little splash zone... but we enjoyed it anyway... and I'm sure that if you have small children, they will also). Keep an eye on the massive splash bucket over the playground - we saw an unsuspecting toddler get pulverised and scarred for life by the massive water dump he was met with soon after climbing up the playground. An overpass conveniently connects the hotel with beautiful Miami Beach just across the street! Walk out to the rocks at low tide, or head there around sunrise or sunset to watch the local fishermen coming in with their catch. If you do go out to Miami Beach, do yourself a favor and stop by Miami Cafe. This family owned restaurant is located right on the beach, has an incredible view, a hospitable staff, and serves up the best chicken curry I've ever had. Serioulsy... and for a ridiculously affordable price. We had two delicious curry dishes, Malaysian pancakes, and two massive beers for less than US$18... And, yes, this is the same fisherman Andrew saw at the beach on our first morning. He even chatted with Andrew's dad on FaceTime! The vacation for your mind, body, and soul. The Spacation is a modern, family friendly spa that offers a wide variety of services ranging from hot stone massages and facials to body scrubs and manicures. Get pampered in an indoor couple or single room, or listen to the waves crash as you get your treatment in an outdoor cabana by the pool. The Spacation is open from 10 a.m. to 10 p.m. daily. Sometimes it's nice to stay on your workout game... even on holiday, and the fitness center at the DoubleTree Resort has all of the equipment you'll need to get your daily pump-up in - (Plus, it earns extra bonus points for having an epic ocean view). Though I personally didn't take advantage of the fitness center, it's still always nice to have the option, ya know? If you've heard anything about Penang, you know that a trip to George Town is a must... and, if you don't know, now ya know. In addition to their many other amenities (that make it seriously hard to leave the property), the DoubleTree Resort also offers a free shuttle straight to the heart of George Town. Wander from Victoria Street near the waterfront to the alleyways and side roads surrounding Armenia Street to see the most street art... or head to Little India for good eats and more colorful streets. Make sure to download the Malaysian version of the mobile app Maps.Me. This offline map is fully functional without data or wifi, and has all of the best George Town street art labeled and pinned! Arrange airport pick-up through the hotel prior to your arrival, or do what we did and get a ride through the Grab App - another essential app download while visiting Penang. The ride took about an hour because our driver decided to take the scenic route (and we stopped to try durian), but, for just 34MYR (US$8.54) we got all the way from the airport to the resort in northern Penang. Ready to plan your trip to Penang? CLICK HERE to book your stay at the Double Tree Resort. Not sold yet? Take a look through the full gallery of photos below first. Disclaimer: I was a guest of the DoubleTree Resort by Hilton Penang, but, as always, all thoughts and opinions are my own.